Korea has now been chosen to be the first country in East Asia to host a Lego-themed amusement park. 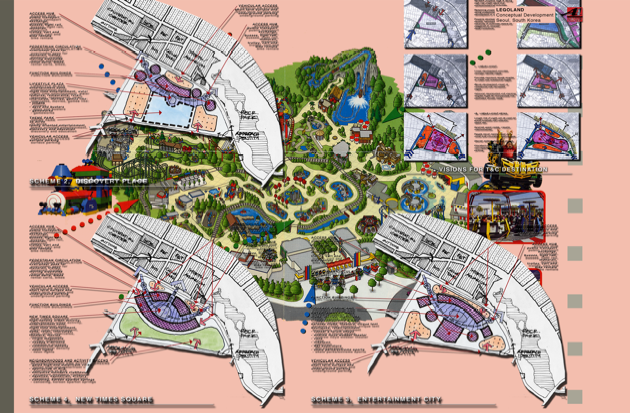 Legoland Korea will be built on Jungdo Island in the city of Chuncheon, Gangwon Province. The desert Universal Studios is not going back in to this project. A revamp of a park in Kentucky. Kentucky Kingdom (formly Six Flags Kentucky Kingdom) closed it's doors in 2009 after a deal could not be reached to renew the park's lease. Ever since November, 2 2009 Kentucky Kingdom has been standing but not operating. Former park owner Ed Heart has since stepped in the give new life. Kentucky Kingdom and Hurricane Bay will reopen in May 2014 at a cost of $43.5 million. “In ten to 15 years we will cover the entire AED900m investment as well as two planned expansions. We are planning expansion one in 2016 and other will come a few years after that,” he confirmed.